Hi I'm Jack Red, E3 displayed some games I could be getting in the near future. Of course I was shocked when the one game I wanted for a few years finally shows up. By many this was the best part of this year's E3 including myself. I am talking about Resident Evil 2 remake. The next day a lot of people played it's demo. I honestly got a lot to say about this that a video or two simply can't do it justice. Resident Evil 2 was the very RE game to got me into this franchise. Even by today's standards was a unique game for it's time. Four possible scenarios telling most the same story brought a new depth to it. This was the best selling RE game until RE5 shortly after it's release. Keep in mind, for a few years we didn't see much of anything. A lot of us even wondered if there was a remake actually coming or simply a sick joke. Thankfully it's neither being made from scratch on REVII's engine. Resident Evil 2 just confirmed both Hunk & Tofu are returning. Some interesting stuff never made it to the final game on PlayStation 1. Similar to Resident Evil remake, a good number of those could show up. This includes three forms of William that got removed due to time constraints. In the final game, William has five forms you have defeat between Scenario A & B for both characters. Only his third form is fought in all four versions of the campaign. Technically RE2 got retold in Resident Evil: The Darkside Chronicles. Although some parts aren't canon you do face all the bosses. They did a great job retelling it the way they did with some major changes to the story. For the longest time, this was the closest Capcom came to giving us a RE2 remake. Resident Evil 2 will cut the number of campaigns in half but they will be longer. New voice actors for both Leon & Claire since their original voice actors decline. Up til Resident Evil: Revelations 2, the same voice actress does Claire in most of her appearances. Originally a two disc PS1 game that's very different from other multi PS1 games. In most of them, they packed a large amount of stuff on just on disc. Final Fantasy VII to IX are among the best examples. In RE2's case, majority of it's content was on both discs. They simply couldn't put all four scenarios on one disc. Funny enough, Resident Evil 2 has been ported to Nintendo 64 and Game Cube. Why because Game Cube discs are much smaller than most disc based consoles. At the same time Game Cube sure packs a lot of power into their games. Nintendo 64 didn't have many games pushing it's limits of the actual cartridges. However Resident Evil 2 was one of the select few to do so. My point is one N64 cartridge & one Game Cube disc packed most of RE2. Obviously in N64's case, yes there's stuff missing but it has it's own new content. Capcom later did this with Devil May Cry 2. Unfortunately they put a new team not familiar with the original Devil May Cry making it. Similar how they went about it even within Devil May Cry HD Collection. Resident Evil 2 is still among the best video game sequels ever made. 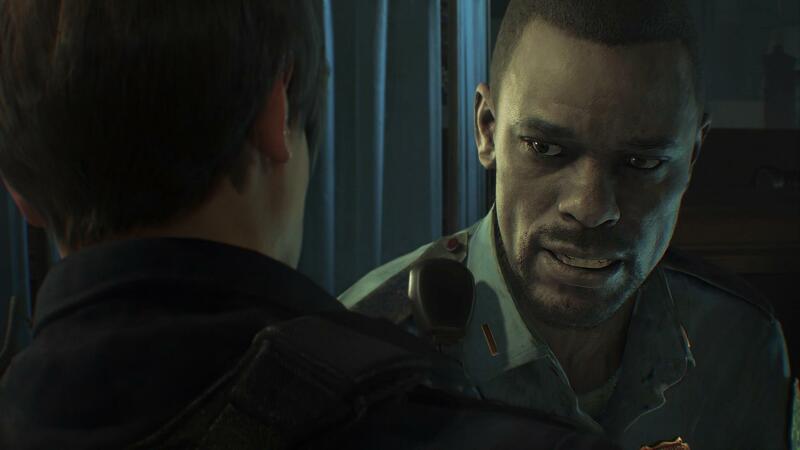 Resident Evil 2 has two main playable characters with a secondary character playable in a few portions. Ada Wong for Leon's scenarios while Sherry Birkin for Claire's scenarios. Obviously you can shoot as Ada but she's not as tough as Leon. In Sherry's case, she is a little girl that can only avoid enemies. She sorta acts as a test to see how well you can dodge enemies. She also takes longer in some areas due to her size. Originally you have two unlockable mini games. First of these is The 4th Survivor that's a hidden fifth scenario of RE2. The Tofu Survivor is virtually the very last thing you unlock in most versions of RE2. The Tofu Survivor is a parody, harder version of Hunk's scenario. This is still one of the toughest RE mini games in history. I know you guys want to really know what I thought about the trailer & demo right? Honestly I was really blown away how good everything was. At first I was funny about Leon's face then I came to like it. They are allowing more grossing stuff than in REVII. Resident Evil remake already puts the bar for video game remakes high. This seems to be similar to Revelations 2 in how they went about parts of it's game play. You got parts of newer RE games with a strong older RE games influence. I personally don't mine over the shoulder view. What I did mine was giving PS4 CODE: Veronica X first with no Xbox One release of any kind. The story is done in a way even those who played the hell out of the original game won't know. Exactly what's coming next similar to parts of Resident Evil remake. Can you believe some fans already want RE3 remake I pass. Resident Evil 2 does a great job being something old while being done differently for newer consoles. According to sources, one of Claire's pre order costumes will be Elza Walker. Those who played Resident Evil 1.5 probably know her. In this demo before they completely changed the game originally had Elza Walker as one of two playable characters. Can I be honest here? I really thought RE1 remake would've given us some of it's costumes in many versions. I was very surprised none of those made it to that version. Instead we ended up getting Chris & Jill's costumes from Lost in Nightmares mini game. Oddly enough both of their S.T.A.R.S. guns with Wesker's is also a part of RE2 Deluxe Edition. I felt in most areas all of it was very good. I was expecting something that wouldn't even come close to my expectations. I am glad they went beyond them, I am very impressed with what I saw. Hopefully within the next few months, we'll find out more about it. This game was in development longer than the original RE2 game. I don't mine that considering it's amazing legacy still holds up today. Resident Evil 2 did a lot for it's time especially more recently. The original RE2 was one of my favorite PS1 games growing up. I don't question how much I'm going to love it's remake. I do believe we might have what could possibly be the greatest Resident Evil remake in history.